Jill Horner speaks with Thomas Butler, with Philadelphia College Prep Roundtable, about investing in professionals who invest in students. Follow on Facebook and Twitter for updates and details. 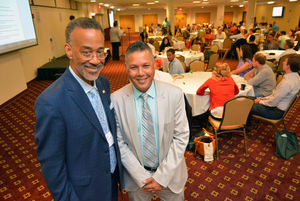 The Philadelphia College Prep Roundtable’s seventh annual professional development conference, a two–day symposium designed to discuss ways to increases academic success for grade school students and to prepare them to succeed once they reach college, kicked off on Monday at St. Joseph’s University. Opening events included a keynote address given by college completion expert Antoinette Torres, and a networking luncheon speech by Temple University Dean of Students Gregory Anderson, Ph.D.
Thomas Butler, the roundtable director of operations and advancement, said goals for this year’s conference are to continue to strengthen the college access and success community by providing quality professional development to those who provide college preparation services as well as center the Philadelphia College Prep Roundtable as a viable and useful resource to students, schools, and programs. Butler, who also spoke during the welcoming presentation in advance of the Torres’ keynote, elaborated on the thrust and purpose of the conference shortly after Anderson’s keynote address. “The roundtable network is a large network, and Philadelphia [being in the network] has a lot of programs that are both in school and out of school that are serving students, getting them ready for college — and adults as well, who are going on to higher education,” Butler said. “The roundtable primarily exists as an advocate for those who have less information than others about not only getting into college, but completion as well. Philadelphia College Prep Roundtable 7th Annual Professional Development two day Conference. BMe Philadelphia leader & 200 Education Practitioners gather at the roundtable to prepare Philadelphia students & families for college access and success. Workshop and conference highlights include effective college access and success practices in middle grades; advanced college advisement for professionals and advocates; insight into the best retention practices for underserved student populations; how to align college access partnerships for non-traditional students; and a plethora of networking opportunities with collegiate advisors and university admission workers. Philadelphia, PA – The Philadelphia College Prep Roundtable (PCPR) and the Pennsylvania Association for College Admission Counseling (PACAC) will present “College Application Day”, on Tuesday, November 18 at Murrell Dobbins High School (2150 W. Lehigh Avenue, Phila., PA 19132) from 9:30 AM to 1:30 PM. PHILADELPHIA, PA – The Philadelphia College Prep Roundtable (PCPR), Philadelphia’s premier college access and success organization, will award $50,000 to 20 college students living in the greater Philadelphia region as recipients of the first-ever Robert C. Digges Courageous Warrior Scholarship. The winning students will be honored at a reception on Saturday, August 9, 2014 from 2-4 PM at The Fairmount Waterworks Education Interpretive Center, 640 Waterworks Drive (Waterworks Drive and Kelly Drive), Philadelphia, PA 19130. PHILADELPHIA, PA- Two-hundred college access and success professionals from throughout the Greater Philadelphia region will attend the 2014 Philadelphia College Prep Round Table (PCPR) Conference on June 2-3 at Villanova University, Villanova, Pa. The conference will be held each day from 8:00 AM to 3:30 PM at Villanova University’s Connelly Center, 800 E. Lancaster Avenue, Villanova, Pa. 19085.
community advocates for equity and college completion will spend Monday, August 19 and Tuesday, August 20, 2013 on the campus of Arcadia University for the Philadelphia College Prep Roundtable’s Fifth Professional Conference. The conference will be held each day from 9 AM to 5 PM at Arcadia University’s Commons, 450 South Easton Rd, Glenside, PA 19038. GLENSIDE, PA- U.S. Rep. Chaka Fattah (D-Pa.), community activists, educators, and parents gathered at Arcadia University Aug. 19-20 for a Philadelphia College Prep Roundtable (PCPR) conference to discuss how to meet the challenges of ensuring students from diverse socioeconomic and cultural backgrounds gain access to and succeed in higher education. GLENSIDE, PA -During the recent Philadelphia College Prep Roundtable conference, Dr. Charles Williams, a youth psychologist from Drexel University, discussed the importance of culture when addressing the value of education. He spoke of the “soft bigotry of low expectations” that impede students’ growth and academic success, and cited the challenges faced by school districts that do not acknowledge the culture of their diverse student populations. GLENSIDE, PA – Jennifer Carroll addresses attendees at the 5th PCPR Professional Conference.